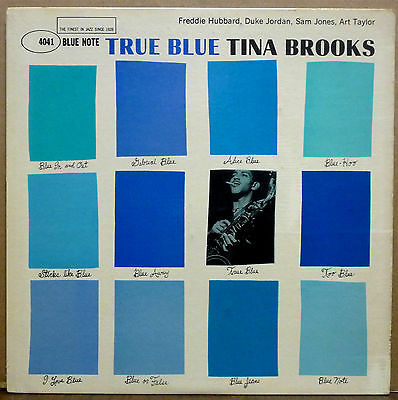 TINA BROOKS "True Blue" BLUE NOTE LP IS AN ORIGINAL PRESSING WITH THE DOUBLE SIDED DEEP GROOVE & 47 WEST 63rd NYC LABEL ADDRESS (MONO 4041). THE HEAVY VINYL ALSO HAS THE "EAR" & RVG STAMP IN THE DEAD WAX. THE GLOSSY VINYL IS IN EX CONDITION WITH A FEW LIGHT HAIRLINE MARKS AND CLEAN LABELS, PLAYS GREAT. THE LAMINATED COVER IS IN VG++ WITH NO WRITING, DOES HAVE SOME SEAM WEAR AT THE UPPER RIGHT. GRAPHICS ARE NICE. PLAYERS INCLUDE: FREDDIE HUBBARD, DUKE JORDAN, SAM JONES & ART TAYLOR.CLEANED ON A VPI RECORD CLEANER. THE VINYL IS STORED IN AN AUDIOPHILE INNER SLEEVE. PLEASE ASK ANY QUESTIONS BEFORE BIDDING. BLUE NOTE RARITY IN SOLID CONDITION.PAYPAL ACCEPTED.ALSO, INACCORDANCE WITH EBAY'S ACCEPTED PAYMENT POLICY, WE ACCEPT VISA, MASTERCARD, DISCOVER, AND AMERICAN EXPRESS PROCESSED THROUGH OUR ELECTRONIC MERCHANT ACCOUNT. YOU CAN SEND US YOUR CREDIT CARD INFORMATION BY EBAY MESSAGE, EMAIL, FAX, OR BY PHONE. International buyers should get shipping quotes BEFORE bidding. ALL ITEMS GUARANTEED, BUT WE DO NOT REFUND SHIPPING COSTS. IF PAYING BY PAYPAL, WE WILL ONLY SHIP TO A CONFIRMED ADDRESS.